Here you can find all info about A-Dawg from Insane Seed Posse. If you are searching for information about A-Dawg from Insane Seed Posse, check out our Basic Infos or Lineage / Genealogy for this cannabis variety here at this page and follow the links to get even more information. If you have any personal experiences with growing or consuming this cannabis variety, please use the upload links to add them to the database! 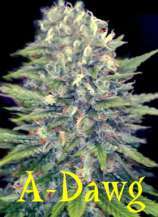 A-Dawg is a mostly indica variety from Insane Seed Posse and can be cultivated indoors (where the plants will need a flowering time of ±58 days), outdoors and in the greenhouse. Insane Seed Posses A-Dawg is/was never available as feminized seeds. Background: The Pre-Invasion Afghan mother was obtained on the upper trade routes of the Indus River in Pakistan, in late 1977 / early 1978, by Ohsogreen, during a Hash Deal. Prior to his acquisition of it (Enabled by the real threat of the Soviet Invasion into Afghanistan), this pure land race, seldom touched an outsiders hands. Years later, around 1990 a Sensi Seeds Afghan # 1 male was used to refine this old line. The mother chosen was an F-4 of that cross. She was very resinous, stable and produced better weight than her sisters. The father was carefully selected from F-1's of Space Dawg, which Subcool made using his Space Queen male (Space Dude) and Chem's Super Snowdawg female. The potency of Chem's Super Snowdawg, coupled with the resin production of Subcool's Space Queen, made a really nice combination all on it's own. The only thing Space Dawg was lacking, was good structure. The Pre-Invasion Afghan mother took care of that. A-Dawg is easy to grow indoors, in a greenhouse or outside. It clones well, has a predominant column like growth pattern, and very little side branching. It works great in SOG setups, or can be concealed easily outdoors. Pheno # 1 - shows up 70 % of the time. It's growth pattern is very column like, with very little side branching. Sativa dominant in effect, with respectable yields. A solid 7 to 7.5 on anyone's potency scale. Pheno # 2 - shows up 30 % of the time. This one grows one set of true leaves, then branches into 3 or 4 separate branches on it's own. Don't cull this one, assuming she's a mutant you will not like. She grows wider / shorter than than Pheno # 1, but still produces similar weight. Her real payoff is the potency, which hits a solid 8. High Type: Soaring head high. Stupefying if over toked. Click to show all parents of A-Dawg in our dynamic family tree map. Do you know something more about Insane Seed Posses A-Dawg? Please help to make this database better and upload/connect your information here! Pictures speak louder than words! Upload your "A-Dawg" Photos here and help other growers to get a better impression of this variety. You have grown A-Dawg together with another variety? Please fill out our Strain VS. Strain direct comparisation form! Our strain reviews are multilingual, searchable and can be very detailed - including data about the grow, aroma, effects and taste! Please upload your A-Dawg Review here to help the other seedfinder users! You have experience with the medical qualities of A-Dawg? Sharing your information here maybe can help other people! You've stumbled upon a A-Dawg related thread into a forum or growers community? Connect it here and enable othe users to find this information fast and easy! You found a related video with additional information or grow-infos about A-Dawg on YouTube? Please connect it here to the strain info page!